Giveaway location : Selected Parkson store where Clinique is represented. 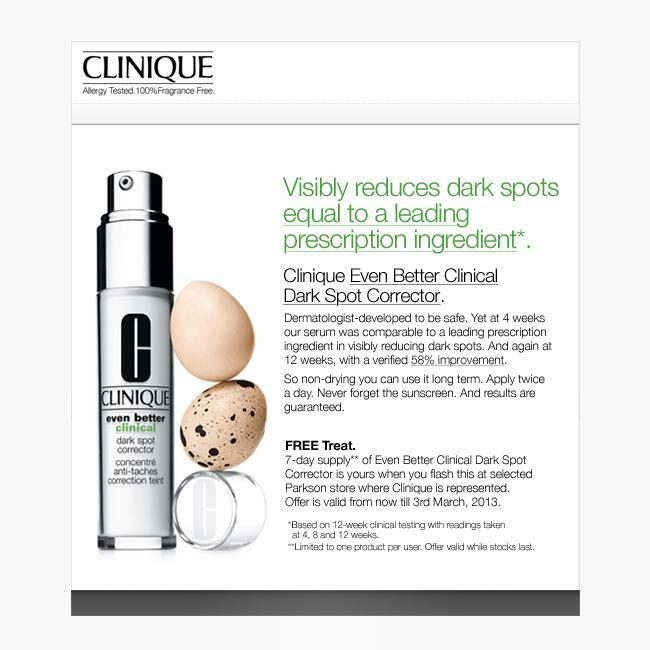 7-day supply of Even Better Clinical Dark Spot Corrector is yours when you flash this at selected Clinique counters in Parkson from now till 3rd March, 2013. **Free Treat is limited to 1 per customer, valid while stocks last. Dermatologist-developed to be safe. 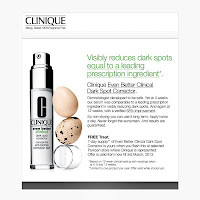 Yet at 4 weeks Clinique's serum was comparable to a leading prescription ingredient in visibly reducing dark spots. And again at 12 weeks, with a verified 58% improvement. So non-drying you can use it long term. Apply twice a day. Never forget the sunscreen. And results are guaranteed.